Synthetic chemicals (plastics, paint, leaning fluids, etc). bacteria-fighting antibodies. It provides oxygenated water to the cornea. tear film to the optical surface. layer. The results are itching, burning, eye-strain and other symptoms. add moisture to the tear film! film, including protective antibodies, replacing it with artificial chemicals. 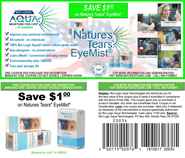 decrease moisture film evaporation), if you apply Nature’s Tears EyeMist first.